Haemorrhagic effusions occurs when blood leaks into a body cavity (the thorax, abdomen or pericardial sac). This occurs most commonly when a blood vessel is ruptured or eroded or when an organ ruptures. The fluid from acute haemorrhagic effusions resembles whole blood, as seen in this case. 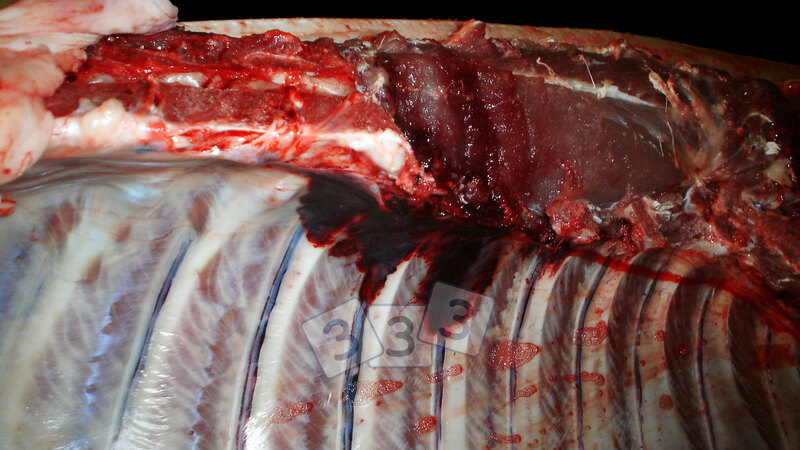 The cause of this haemorhagic pleural effusion is the method used for stunning the animal in the slaughterhouse, electrocution.The electric shock causes a sudden spasm of the body that could break blood vessels and leaking blood in the pleura, as seen in this picture.